I really feel I should not have to explain this but after many weeks of finding lots of memes (which I will not re-post here) regarding this subject I will take a moment to write this really brief post. Let me give you a quick answer: BECAUSE MARVEL TOOK THE TIME TO ESTABLISH THOSE SIXTEEN HEROES IN THEIR OWN MOVIES. You get it? Makes sense to you? Great, you can stop reading now. Let's make a recap of each movie; Civil War will have Scarlet Witch, Black Widow, Captain America, Agent 13, The Vision, Iron Man, Hawkeye, Winter Soldier, Ant-Man, Crossbones, Black Panther, Baron Zemo, Falcon, War Machine, and Thaddeus Ross. Out of those characters, the only debuts will be Baron Zemo and Black Panther; all of the others we already know as characters, and their place on the world. Hell, we are so familiar with these characters and their relationships that now we are getting a whole movie centered around tearing down and deconstructing said relationships. 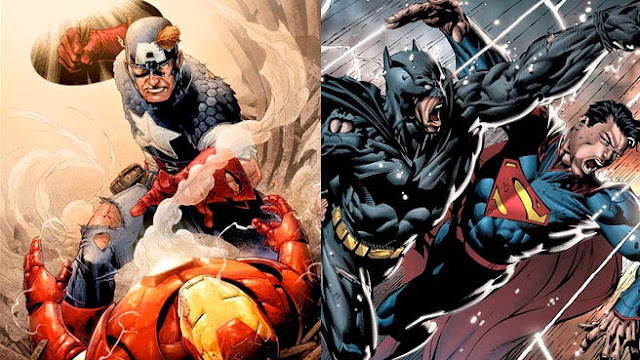 We can picture them fighting because Marvel Studios has taken its time to establish the core values and motivations behind all of these characters. Now let's recap Dawn of Justice: the movie will have Aquaman, Wonder Woman, Superman, Batman, The Flash (Cameo/Rumored), Lex Luthor, Alfred, Cyborg and Doomsday (Rumored). And out of those character only Superman has been established and since there haven't been any sequels to Man of Steel, we are not really that familiar with his place on the world, because of that the trailer for Dawn of Justice was almost exclusively about establishing that subject. And if that whole vibe is setting the tone for the DC Cinematic Universe how can we expect to believe that Aquaman and Wonder Woman will be well received in this Universe? Both of them are basically gods, just like Superman. And exactly why are they interested in protecting the planet? Will Doomsday be the final threat of the movie? The one that will unite the Seven? It's not that Dawn of Justice is overcrowded with characters; it's overcrowded with origin stories. This movie has the job to establish or set up at least five larger than life characters. I absolutely believe that Jesse Eisenberg can pull a killer Luthor; what I don't believe is that his motives behind hating Superman can be established in two and a half hours when you also have to set up a conflict between Supes and Bats, a resolution to said a conflict and a threat that will at least make them and Wonder Woman join forces in a believable way within that universe and after the first conflict. I am the kind of guy that will shed tears of joy while watching a superhero movie (and it has actually happened). You can put the Batman logo on a cookie and I'll soil myself out of excitement, but I still have a hard time believing that Dawn of Justice will pull it off. The reason why Avengers worked in the first place is because it had only to concern itself with establishing relationships, not characters. The reason why Civil War will work is because it will concern itself with deconstructing said relationships. That, you can do in two and a half hours; establishing characters and relationships? Nope. This movie will save the DC Cinematic Universe. My guess? Dawn of Justice will flop (at least critically) and Suicide Squad will be a hit. I have no idea how the DC Cinematic Universe will be reshuffled after that. I make videogames. Superhero culture is the closest thing I have to a religion. Hopefully one day I will explore space, but meanwhile I´m happy replaying Mass Effect. I seriously want to achieve immortality, not joking on this one. My self appointed mission in life is to make the world a happier place. I´m a walking and talking self help book, also, I TOTALLY BELIEVE IN YOU. You don't speak for everyone. Who cares if Marvel introduced these characters in other movies? you mean 12 other movies? So I need to watch 12 movies to understand what happens in Civil War? That's just plain bad filmmaking.